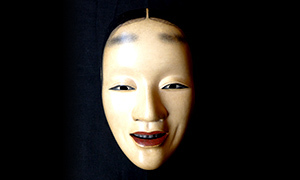 Noh masks, called “Omote” in Japanese, are worn by the Shite role when Noh is performed. 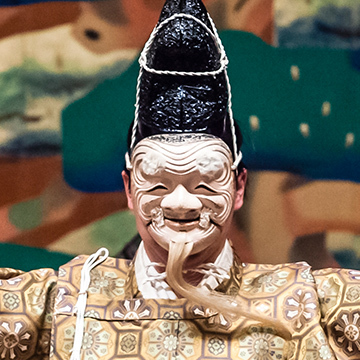 In the olden days, Noh masks carried a religious meaning so people didn’t wear them in situations which didn’t have religious meaning. 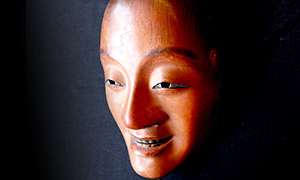 Also, it is said that it was fundamental for the Noh masks that were used as rituals equipment to be burned down or flown into the river. 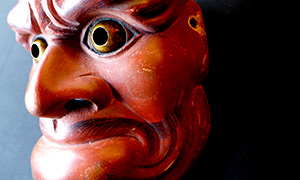 As the Noh developed, many forms or rules were added to the Noh masks and a lot of symbolism was put into in the color of the eyes, the color of the masks, the shape of the eyebrows or mouth and the bone structure, then they started strongly expressing the profound expression of beauty which balances the realism and abstract. 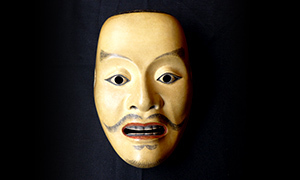 By the end of the Muromachi era (15th century), the basics of today’s Noh masks had been all completed, and the hereditary mask artisans were born. 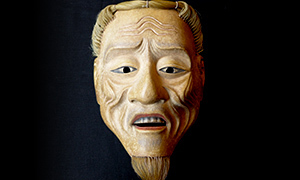 In the Edo Era (17th to 18th century), the artisans would emulate the outstanding mask out of many varieties and a lot of thought was put into it. 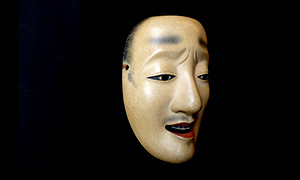 The actual Noh masks that are used on the stage, even if they are put into the same category, have different facial expressions and characters in each depending on the difference of the era or the playwright, or the frequency of usage on the stage, and thus there isn’t even a single same pair. 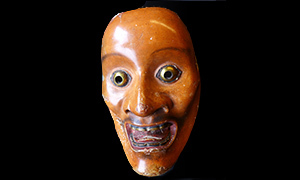 Today, it is said that there exists about 60 basic types and two hundred and some tens of Noh masks. When classifying them, even though they could be categorized into six types such as the masks of the Okina group, old man, demon, women, vengeful ghost and men, there is a slight difference in the way of categorizing depending on the researcher. In addition, when the masks are actually used, the classification is not absolute and the actor decides the overall judgment such as the facial features, dignity, impression, the compatibility to the play and the compatibility to the costume each mask has. 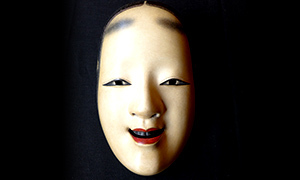 This is an extremely special style among Noh masks and it is the most sanctified. 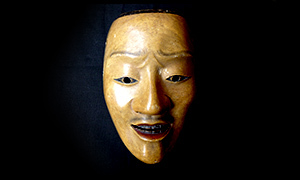 Even though these masks are also “old man” as well as the masks of old man, it is referred to the masks used in “Okina” which in Noh is described as “It is Noh, but it’s not really Noh.” In addition, they were crafted in the oldest period, and their carrying a different style compared to the other Noh masks is also one of their characteristics. Its facial expression is smiley and well-fleshed, the bottom jaw is separated, and it has a plump face with bushy eyebrows. 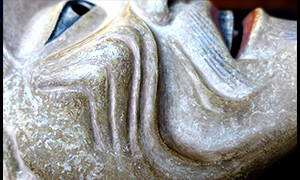 It is said to be the mask that symbolically expresses the celebrational speech. Though there are various opinions about who Okina represents, it is said to be an indigenes god or arts at temples turning into Sarugaku. 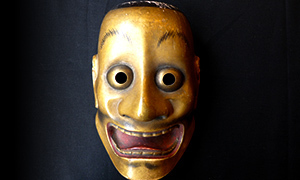 Sarugaku refers to Gigaku—an ancient musical in which actors perform along with music wearing masks— which was passed on from China, and/or Sanraku—magic, acrobatics, conjuring, dance and so on—that became popularized with various arts, and especially what developed to comedic art or sketch. Sankoujou "Kuzu Mae Shite" etc. Asakurajou "Chikubushima Mae Shite" etc. Koushijou "Himuro Mae Shite" etc. 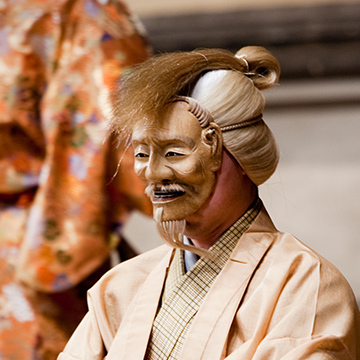 The masks of old man are referred as joumen in Noh. Its characteristics are tied hair with high cheek bones and though they appear to be old man-like with their thin figure, the teeth are straight. There are all kinds such as Koushijou or Sankoujou in Jou, but jous that have their own names have design characteristics and each represents the masks' personality. It is used for the senile spirit of plants, the gods of senile body and so on. The origin of its name is its deep wrinkles which represent the age and it is proof of long life which exceeded the human understanding. It is the old man who dances peacefully with an introspective look in his eyes. Oobeshimi "Kuramatengu Ato Shite" etc. Fudou "Kuzu Ato Shite" etc. Kurohige "Chikubushima Ato Shite" etc. 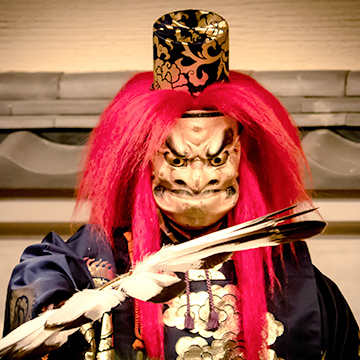 There are many kinds such as tengu (a legendary creature said to be a supernatural monster or sometimes a god, who learns Buddhism but uses black arts), god, dragon, and demon who harms human. 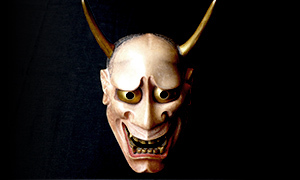 When it comes to demon, it's generally thought that it would have horns, but the Noh mask of demon god doesn't have any. Also there are a small number of masks that have fangs. 口を開け、目を飛び出すように見開いた、威風堂々とした神として登場する面です。全面金泥彩色で目に鍍金銅板が嵌められ、威圧感が強調されています。With the mouth open and wide-opened eyes as if they pop out, this is a mask that appears as a god with full-flown dignity. It is fully gold-painted and plated copper is put in the eyes and thus the dignity is emphasized. 主に地上を軽快に疾駆する神霊を表します。　飛出と癋見は一種の対照にあり、「阿吽」をなしています。「鵺」「小鍛冶」「殺生石」などに使用されます。This mainly represents a spirit that lightly roams the land. Tobide and beshimi contrast each other in a way and they create "A-un.”* It is used in "Nue""Kokaji" "Sesshouseki"and so on. 「癋見」とは「口をへしむ」からきており、下顎に力を入れ、口を真一文字に結んで見据えています。地獄の鬼の役などに用い、赤味の強い彩色が特徴です。The word "Beshimi" derives from the Japanese word "heshimu" and it means fixing the jaw with the lips tightly closed and staring eyes. It is used for the role of demon from hell and a strong red color is its characteristic. *"A-un" is one of the Buddhist chants. "A" is the first sound you create with the mouth open, and "un" is the last sound you create with the mouth closed. Therefore, those two words are considered to represent the beginning and the end of the universe respectively. 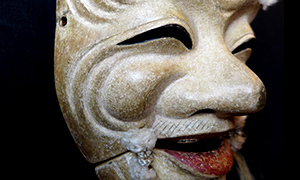 The mask's facial expression, whose emotional expression is ambiguous, is called "neutral facial expression" and the mask of woman is the representative of it. There are "Koomote," "Zou," "Fukai," "Uba," "Roujyo,"and so on depending on the age and dignity. 能面といえば、この面をまずこの想像する方も多いかと思います。額から頬にかけて三本平行に毛が描かれているのが特徴です。小面の「小」には「可憐、かわいい」などの意味があり、女面の中では最も若い女性を表している面になります。There are probably many people who would imagine this mask when it comes to Noh masks. The three hair line is drawn parallel from the forehead to the cheeks. Koomote's "Ko"means "lovely" or "pretty" and so on, this is the mask that represents the youngest female among the mask of woman. Hannya "Dosyouji Ato Shite" etc. Mikazuki "Funabenkei Ato Shite" etc. 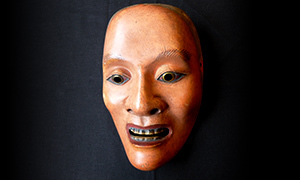 This is a kind of mask that represents something that is not a human, something that is becoming a non-human, or a woman who dies with indignity in the battle or who dies after going insane with jealousy and becomes a cursed spirit. 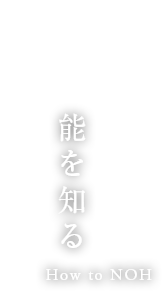 There are "Ayakashi","Kawazu" and so on in male vengeful ghost. 怨霊の面、女面、どちらの分類にするかは解釈により異なる面です。能の山姥は、風貌怪異ですが化物ではなく、深山幽谷の主であり、宇宙の象徴ともいえる超自然的で神秘的な存在です。落ち着いた赤味のある肌と白髪、鍍金銅板が嵌められた鋭い表情の眼が特徴です。This is a mask categorized differently depending on the interpretation, whether it belongs to the mask of vengeful ghosts, or the mask of a woman. 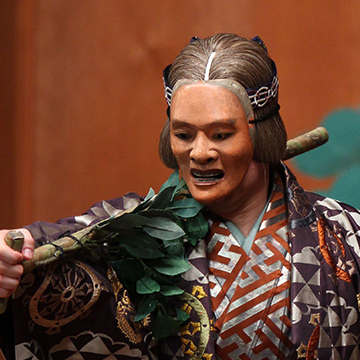 Yamanba in Noh is not a monster but it is a lord in the deep mountain and valley and a supernatural mystical being that could be a symbol of the cosmos, even though its appearance is odd. The subdued reddish skin, the gray hair, and the eyes of plated copper that are put in are its characteristics. 般若や生成(なまなり＝般若になりかけの小さな角の生え始めた面)は、鬼面の蛇類とも分類されますが、これは鬼神の面と異なり、嫉妬や怨み、悲しみといった女性の感情から生まれる人間の鬼の表現となっています。恐ろしくも悲しい人間の内面に棲む「鬼」の執心の凄まじさを造形にしています。Hannya or Namanari (a mask,that is almost becoming Hannya, whose horns are beginning to grow) are categorized in the snake group of the demon mask but this is different from the mask of demon god. Instead it represents a human's demon that is born from female feelings such as jealousy, grudge, and sorrow. The fierceness of obsession of the horrifying but sorry demon that inhabits inside of human is designed. Compared to the mask of woman, it is the characteristic of the mask of man to be often separately made by the difference of the status or the circumstances. There are many kinds such as samurai, nobleman, ghost, god of man, and child. It is also its characteristic that there are many special masks that are used for specific music. 日焼けした勇猛な武将の表情の面です。勝ち戦を題材とした能「勝修羅」の能のみに使用されます。This is a mask of the facial expression of a tanned valiant samurai. 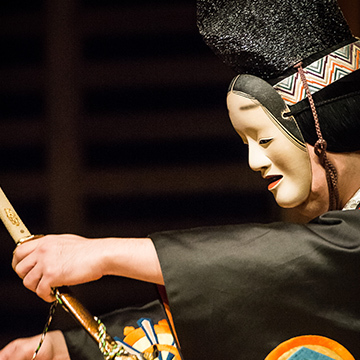 This is used only in Noh "Kachishura" whose theme is a triumphant battle. 美男の代名詞とされ、「伊勢物語」の主人公と同一視されていた在原業平を模した面です。端正で教養と気品のある貴族的な顔立ち、眉間の皺から漂う哀愁により、「融」、「清経」などの演目に使用されます。This is a mask that imitated Narihira Ariawarano, who was considered a synonym to a handsome man and who was identified as the protagonist of "Tales of Ise". 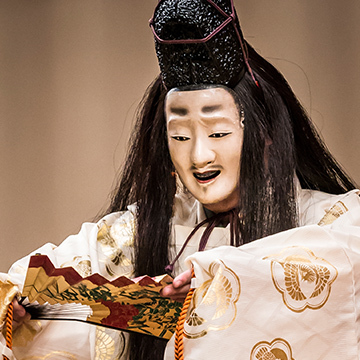 With gracious and aristocratic facial features with culture and sophistication, and the sorrow that drifts from the wrinkle between the eyebrows, is used for performances such as "Touru" or "Kiyotsune" and so on. 眉根を寄せ、人生に懊悩する哲学青年「盧生」の面差しを表します。盧生は尊い仏道の師を求める旅の途中、邯鄲の里で不思議な枕を借りて床に就きます。盧生は帝となり50年の栄華を過ごしますが、それはすべて夢、食事ができるまでのほんの短い間のことでした。悟った盧生は心穏やかに故郷に帰っていきます。This mask shows the facial feature of a philosophical boy "Rosei"* who agonizes about life with frowning eyebrows. Rosei borrows a wondrous pillow in the village of Kantan** on the way of a trip to quest for a noble master of Buddhism and goes to bed. Rosei becomes the emperor and spends 50 years of glory but it is all just a dream and it was just a short moment till the meal was prepared. Realizing this, Rosei goes back to his hometown with a calm heart. 猩々は、満月の夜に海中より現れ、浜辺で酒を舐めつつ波と舞い戯れるという、酒好きの妖精です。水中から上がったばかりで濡れ乱れたかのような髪の毛に赤ら顔で、能面には珍しく、微笑んだ少年風の顔です。祝言性の高い「猩々」専用の面です。Syoujou is an alcohol-drinking fairy that appears from the sea on the night of a full moon and plays and dances with waves while licking alcohol on the beach. 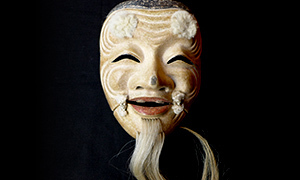 The blushing face with wet hair as if it just got out of the water is rare in Noh masks, and it has a smiley boy-like face. This is a mask exclusive to "Shoujou" that has a high celebrational address nature. He is the protagonist of a fantasy novel "The World Inside a Pillow" made in China around the 9th century. "The World Inside a Pillow" is known for its "a vanished dream", a saying meaning prosperity and decline are just a dream. " **The village of Kantan indicates a city in Zhao, China in the era of battle and it is located in the current south of Hebei Province.